The Norfolk Cultural Council is sponsoring this event at the Norfolk Public Library. Artist reception is on Saturday April 20th from 5pm - 7pm where they will announce the awards. 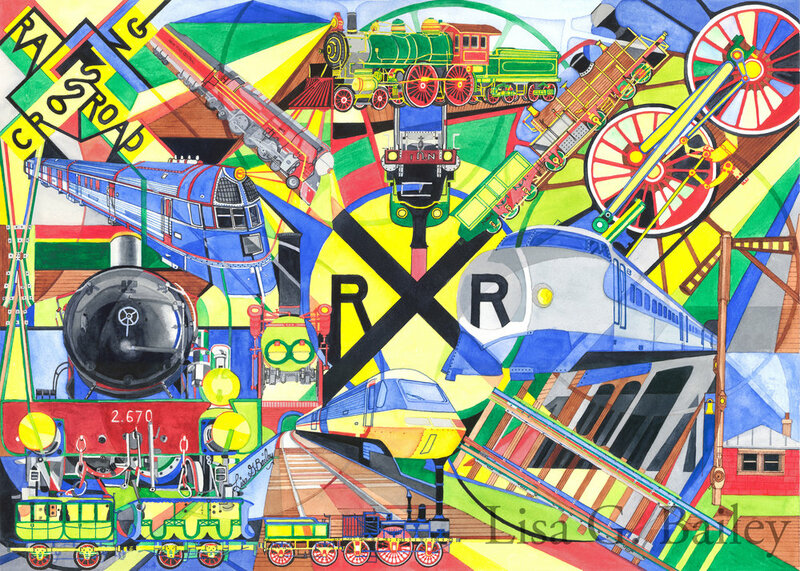 Foxboro Art Association is sponsoring ‘The Really Big Show’ in Patriots Place at ‘The Artists Studio and Gallery’. This is a members only spring show that will be juried for awards. This nature themed exhibition ‘Enchanted Forest’ is Attleboro Arts Museum’s most popular event. All the artwork is original visual expressions of the natural world: floral, landscape, underwater, weather, wildlife, insects, etc. Different mediums will be on display including the ‘Flowers in Fashion’ Exhibition where individuals design and create a magic wand using live or dried floral and plant materials. This exhibit will display only watermedia in varied subject matter by members and will be juried for awards. Opening reception is on March 16th from 2- 4pm. RIWS will be hosting this juried mixed media exhibit with artwork inspired by the pigments, hues, and tones all around us. I will have a colorweave watercolor ‘Preparation’ and a mixed media painting called ‘Seeing Double’ on display. Opening Reception is February 16th and is open to the public. This juried exhibit is being hosted by The Guild of Boston Artists. All the paintings are rendered in watercolor, there is no theme related to the subject matter. The opening reception is this Saturday February 9th from 2 - 4pm. This show will have all media and styles represented by all the local artists. Opening Reception will be on Saturday, Dec. 8th, 2 - 4pm. 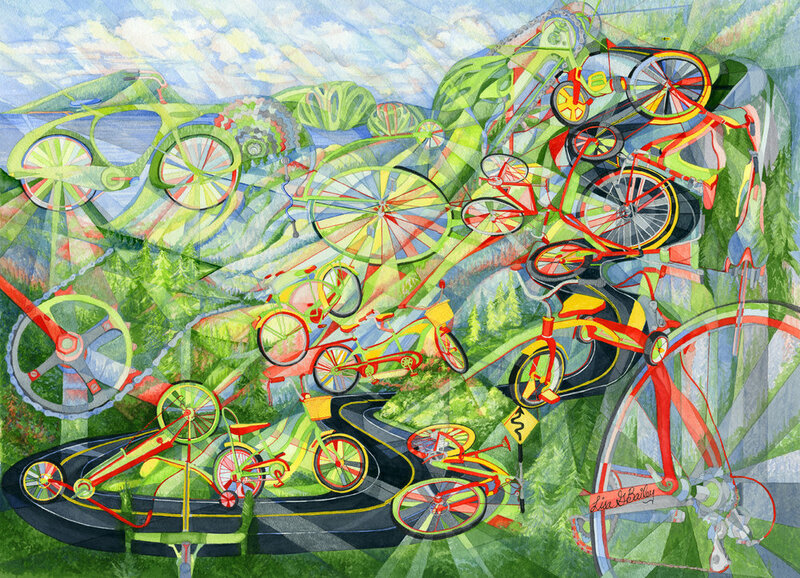 This exhibit will debut two of my artworks: Gone Pedaling - colorweave watercolor and Tales of Land & Sea - acrylic. The Framingham Public Library will be hosting the Framingham Artists' Guild members Show. This will be the Premier debut of my acrylic ‘Efflorescence’. Also on display will be my mixed media painting ‘Seeing Double’. The Morini Gallery at the MMAS is pleased to announce the upcoming Holiday Art Sale. Artists are juried into this show to share and sell smaller pieces that make for special and unique holiday gifts. The Artist Reception is November 17th from 5 - 7pm. I have two acrylic and three watercolors ready for sale. Gallery Hours: Tuesday - Friday 10am - 4pm and during Black Box Theater performances. Whether you love watercolor, oils, or acrylics, please come and visit this fantastic fine art exhibit. This winter show will display artwork from only local artists. I will have six pieces on display and all the artwork is ready to hang in your home or office. Consider purchasing a painting as a holiday gift this year. 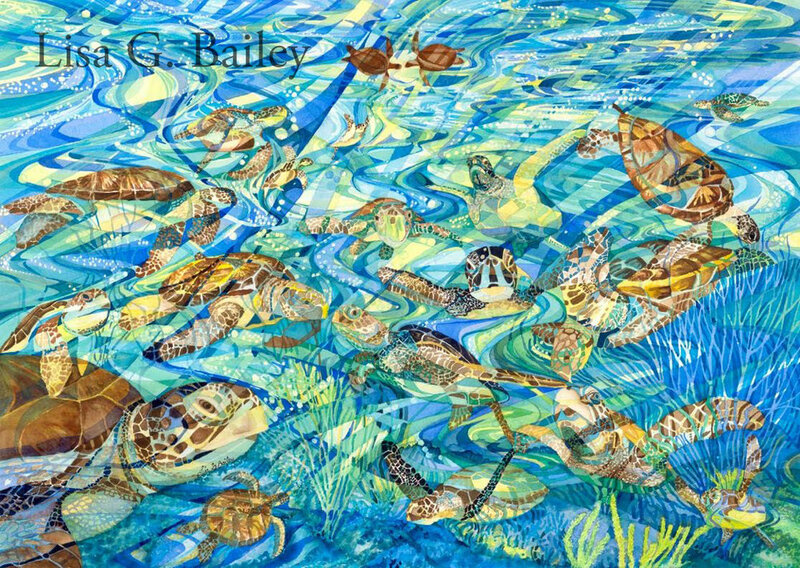 Lisa G Bailey.colorweave watercolor ‘Turtle Turtle’. available as a Giclee print for $150. The Gallery will be hosting the Foxboro Art Associations second Fall members show. This will showcase larger pieces of artwork that start around 12" x 16" to 48" x 48" framed, suitable for over a chair, couch or bed. A variety of styles and media will be available for sale. I will be selling the original Colorweave watercolor called '7 of 9 Lives'. This painting is also available as a Giclee in my store for $150. This Gallery will be hosting the Foxboro Art Associations fall exhibit of small works. The Spotlight Preview Exhibition Opening Reception honors all the donors and sponsors on Thursday, October 11th at 6pm. This event is free and open to all. The Museums online Auction will run from October 11th - 31st, 2018; biddingforgood.com/attleboroartsmuseum. The online Auction kicks off the bidding in advance of the live/silent event. Come to the live/silent Auction event on Saturday, November 3rd. Tickets are available for purchase at the museum for $35 which includes hors d'oeuvres and wine/beer. 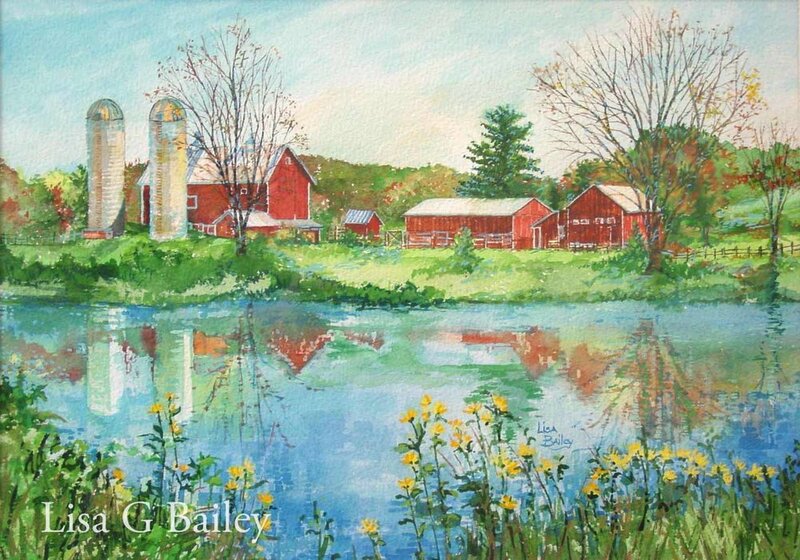 The Norfolk Library will be hosting the Franklin Art Associations Fall members exhibit. The cheese & cider closing reception will be on Saturday, October 27th from 4 - 7PM. 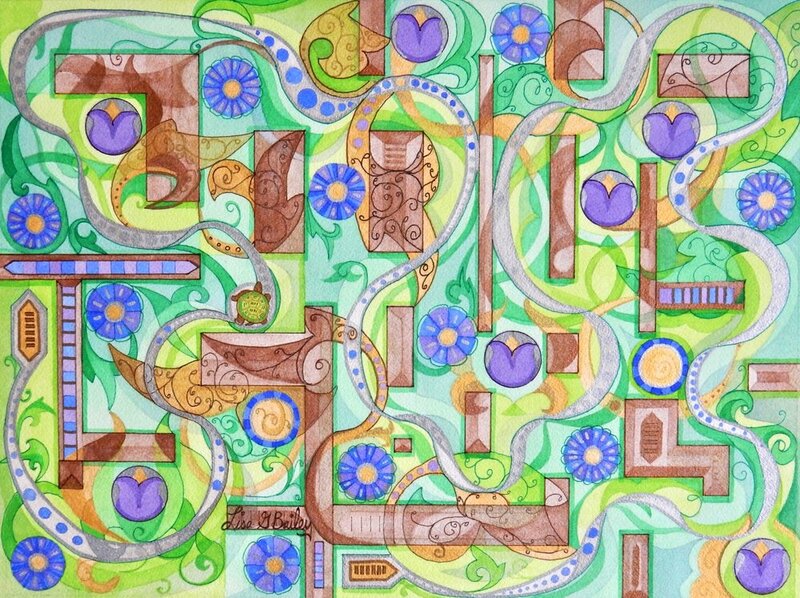 I will have two paintings on display: colorweave watercolor 'Press On' and mixed media painting 'Labyrinth'. New England Watercolor Society is having their 16th Biennial North American Open Show. The reception will be held on September 16th from 2:00 - 4:00 pm, with awards announced at 3pm. There will be a watercolor demonstration by the juror Iain Stewart from 1:15 - 2:30pm. 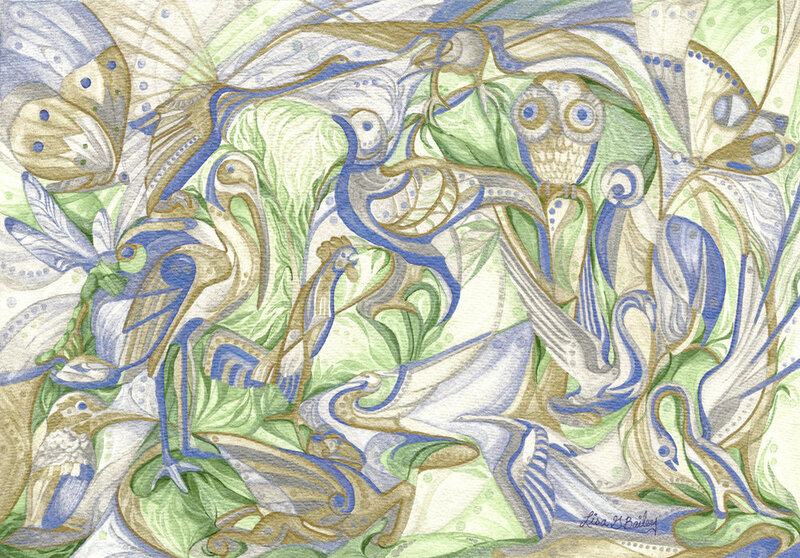 My Colorweave watercolor 'Peanut Convention' will be available for sale at the museum during the show. 'Peanut Convention' giclée is also available in my store for $150. Hopedale Cultural Council wishes to invite you to the 39th Annual Fine Arts Festival. There will be a fine art exhibit (under the white tent), artists booths, live music, games, dance, and a wide variety of foods will be offered. 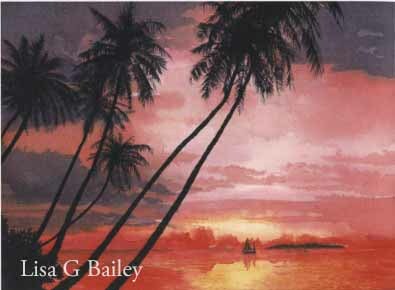 I will have three paintings on display: Seeing Double (Premier Appearance), Press On & Sail into Spring. Join us in celebrating arts in the community at the '10th Annual Open Arts Juried Show'. This show was open to all photographers & artists of all mediums and subjects, was created to let artists in the community experiment with unlimited range, and to share their amazing talent with the MetroWest neighborhoods. This exhibit will be juried for awards that will be announced at the reception on September 13th, 2018 from 6 - 8pm. All artwork is for sale. Premier Image Gallery will be hosting the Framingham Artists' Guild summer members show. The artists reception is on August 30th from 5pm - 7pm. I will have three paintings in this show; awards will be announced at the reception. I will be selling my oil painting 'Smoky' and my watercolor 'Natures Secret' during this exhibit. My colorweave watercolor 'Turtle Turtle' will also be for sale. A giclee of 'Turtle Turtle' is available in my store for $150. The Cape Cod Art Center will host their Annual Open Juried Exhibit 'The National'. All media categories will be juried for awards by a three person panel. I had my colorweave watercolor 'Peanut Convention' accepted into this show. Original Painting is available for sale at the show. A have giclee prints available for sale on my website for $150. This Juried show includes local artists working in any 2-D media. All the paintings are for sale and will feature a variety of styles and subject matter to suite anyones needs for their home or office space. The Framingham Library is hosting our Spring Members Show, which will be a juried exhibit. There will be a variety of artists, styles, mediums, and subject matters on display. My painting "Classic Wings" will be on display; Giclée prints of this piece are available in my online store for $150. This is a juried art competition sponsored by the Norfolk Cultural Council open to all artists and is all 2-D media. Viewing is available in the Community room during regular Library hours. 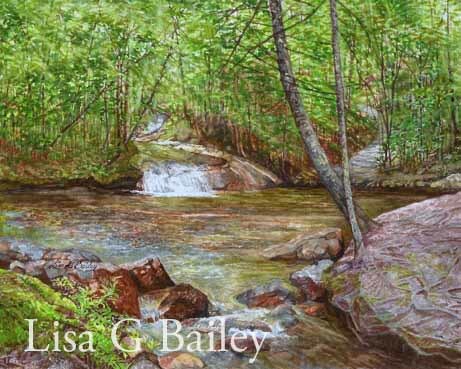 Contact Lisa G Bailey directly to purchase either of the watercolor pieces. Award Reception on Friday June 1, 2018 from 6 - 8PM. Cape Cod Art Center is hosting this national exhibit being displayed in both of their Galleries. This show has multiple mediums and will include two of my Colorweave watercolors; Wind in Motion and The Crossing. Giclee prints of both paintings are available for purchase in my store for $150 each. The reception will be Thursday May 17th from 5 - 7pm and awards ceremony at 6pm. 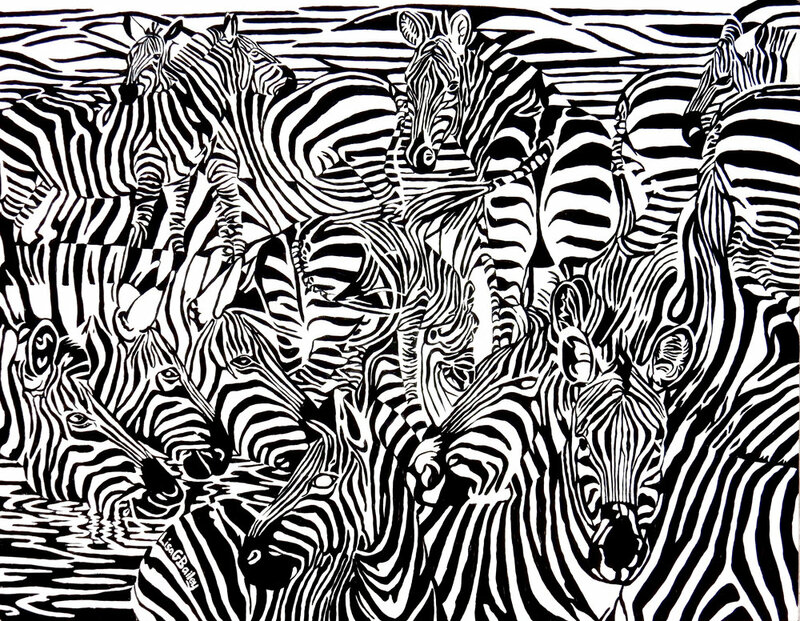 The Black Box will present the Franklin Art Associations annual spring exhibit and sale. This is an all media event with a variety of subject matter and sizes. The artwork will be juried for awards in five categories. Many artists will also have bins with additional selections of unframed work for visitors to browse. I will have two pieces as well as a bin with my giclee prints. The hours will be Saturday 1 - 8pm and Sunday 12 noon - 4pm. This exhibit will display only watermedia in varied subject matter by just members and will be juried for awards by Andrew Kusmin. Opening reception is on April 7th from 2- 4PM. This is Attleboro's most popular event and is celebrating its 22nd year. The Show's nature-themed art exhibit is center-stage. All local artists are invited to enter a nature themed painting from any media. Also on display will be Flowers in Fashion: One Small Step Floral Footwear Designs. All the flower arrangements must be handcrafted using mostly natural, live and dried materials that cover one shoe. Tickets available in advanced and at the door. This show is for all 2D media by artists residing in New England. The exhibit was juried by Ralph Acosta and the opening reception is on Feb. 24th, from 2 - 4PM. I had two paintings accepted: Labryinth (colorweave watercolor) and Smoky (oil). Arts for Everyone is the spirit of their tagline. All members are invited to participate in this annual exhibit where their artwork is accepted. Then once the work is displayed the guest juror will award prizes. An opening awards reception will be on Sat. Dec. 9th from 2-4pm. I will present two examples of my Colorweave style: the premier viewing of 'Press On', and 'Classic Wings' painted with iridescent watercolors. This is the Framingham Artists Guild fall exhibit. Every member is encouraged to enter and then the juror selects the awards. The artwork is on display in the lobby entrance and is open to the public during library hours.